This plains game hunt is a great opportunity to get 4 of the most popular species on one hunt. 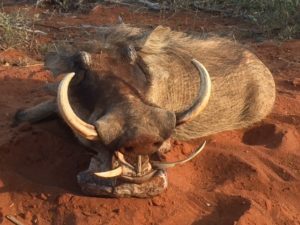 This hunt includes a Zebra, Warthog, Wildebeeste and an Impala. Hunters may add any other available species for the current trophy fee. Hunters may also add on days or bring observers for an additional charge. This 7 day hunt occurs at one of our premier lodges in Limpopo province which features luxurious and comfortable chalet accommodations to welcome the hunters after the hunt. Hunters will be guided by JP Big Game safaris staff.